One of the greatest ways to get around Berlin is by bike and Deutsche Bahn’s Call-a-Bike is a really convenient way of hiring one. The silver and red bikes are usually scattered all over the city. When you need one you hire it by the minute and when you are done you just lock it up and leave it at a busy corner for the next person to use. To register you need to sign up with Deutsche-Bahn and give them a credit card. They’ll then test it by deducting a starting €5 from your account. Don’t worry, you don’t lose the money. It gets put towards your bike rentals. When you need a bike in Berlin you can look up on the Internet where the nearest is. They all have little locators built in so the system knows in real time where all of the free bikes are. Or you could just grab one on the sidewalk. Busy intersections usually have a couple although in the peak summer months it can be hard to find one. Once you’ve found your Call-a-Bike just call the phone number on the side of the bike and get an unlock code. This starts the clock ticking on your rental. If you stop and want to keep the bike for later you can lock it again while still paying the per-minute rental. When you are done you let them know and lock the bike and that stops the clock. 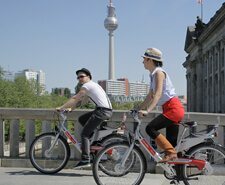 For short trips and convenience it is hard to beat Call-a-Bike Berlin but if you are planning on doing a lot of cycling over two to three days then you might be better off hiring a bike from one of the many rental shops that are all over Berlin. These bike rentals usually charge on a sliding scale so it is cheaper by the day if you rent for a couple of days and is most expensive if you just need a bike for a few hours. For short trips or one way rides, though, it is hard to beat Call-a-Bike. The number to call from abroad to get Call-a-Bike is : +49 (0)345 292 970. Don’t worry, they usually have someone who speaks English on the phone. You can also download an iPhone app that helps you find the nearest bike. To do that you can click on this link or use your phone to take a photo of the following bar-code that will take you to the app store. If you are using Android you can download an app from Google Play here. You can also download an official pamphlet in English from their official site here or get one from this site at this link: call-a-bike in English. For a Map of all of the Call-A-bike stations in Berlin click here: call-a-bike-stations-map. This is not for tourists, very complicated registration process. Need a German credit card for the registration, they do not accept Visa or MasterCard. The Website is only in German, no English version. They have a registration form in pdf format that you need to PRINT out and send to the company to register, HELLO, THIS IS 2011!!!! Ever heard about electronic applications????? Even if I did that, a German credit card is needed. I have to disagree. It is a bit complicated but they accepted my Amex card when I joined (although it may have helped that I also had a Bahncard for discounts on the railway). I joined online and found them friendly and helpful. Do not use this service – it is fraudulent and charges you a set up charge of 48 euros when we swiped our card and the bikes did not even unlock so we could not use them. I emailed them twice to say we do not authorise this charge and not had any response. Not happy! I’m really sorry to hear that. Could you give me a bit more detail as to what exactly happened as this is the first I’ve heard of that, and have used Call A Bike quite a bit myself. I was in berlin a week ago and hired those bike using my UK MasterCard. It says you only be charged about 12.50 Euro per day. When I received a invoice a week later it says they going to charge my Credit Card £12.50 plus VAT and a one year membership for about 42 Euro!!! It doesn’t say about that fee anywhere when you signing up!!! I am going to call my bank and block it. Hopefully it is possible to do it, as they still didn’t charge me yet. An update to the above. After my email to Call A Bike they refunded my the deposit money!! !